And now let me introduce our Judges….. Hailing from far across the seas… with a great number of accomplishments in mapmaking, upatch support, and distinguished veteran of the game, Pawel!!! He is joined by a relatively newer player but one that has made his mark in the forums since his arrival, he plays with tenacity and fights to the end, a real tough opponent, Here’s Disenchanted!! (seriously folks… these two did a great job and spent many hours on these maps, when you see the details of our discussion you'll know what I mean. I really appreciate their efforts). When you go to the links above you will see the discussion that took place while reviewing the maps. Starting March 15, you can post your score for the map 1-10, only vote once for each map. You do not have to vote for every map but we encourage you to do so. We also encourage you to leave your comments in the download section and rate the map there as well. Don't vote and leave scores in this thread. Between now and Mar 15th we ask you to review the maps once again and get ready to vote. Voting will remain open until the end of March! Judging – The judges based their decisions on the standard categories (creativity, playability, map design, balance for MP, see the link HERE for a good guide) they also took into account how well the map fit the theme. Your method for scoring can be whatever it wants to be. Judging will begin next weekend (approx Mar 15) and will continue until the end of the month. During that time you can vote ONCE for each map. 2 - how many points can I give a map? You can score a map from 1 to 10 points. You can only vote ONCE for each map, you can vote for every map (and we encourage that). 3 - Can mapmakers vote for maps? - Yes and No.. YES, there is going to be a special award for the maps from the mapmakers. 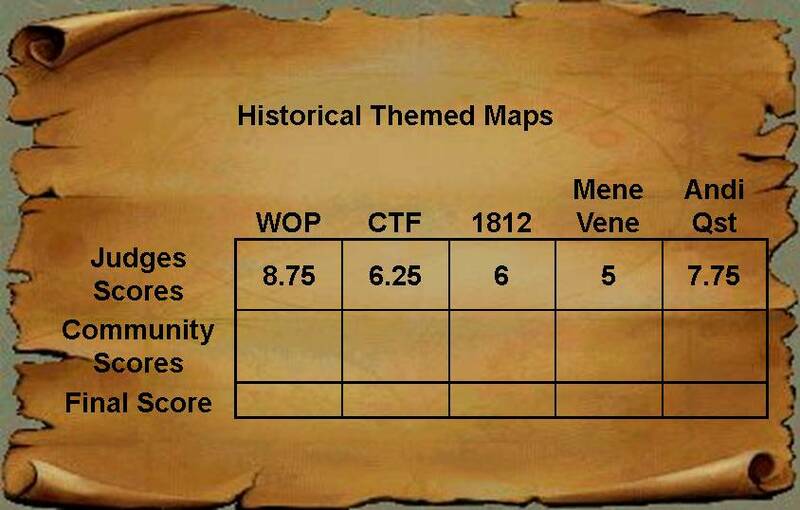 The scores from the 6 mapmakers will be pulled out separately to determine which map they liked best. That map will be given the "Mapmaker's Choice" award. No judges, no community, just mapmakers and their choice on the best map. NO, these scores won't be used to select an overall winner. 4 - Can mapmakers encourage others to vote for them? Yes, they can make comments and send emails to garner support. 5 - Why are the threads locked with the judges comments? Judging has not started yet... when it does the threads will be unlocked. All threads have been unhidden and can be seen (I've been working on this for weeks now). Threads are locked and some of the judges comments are in the map threads, more samples of the discussion will show up today as I get to them. Working on news posts and other things to advertise the events. 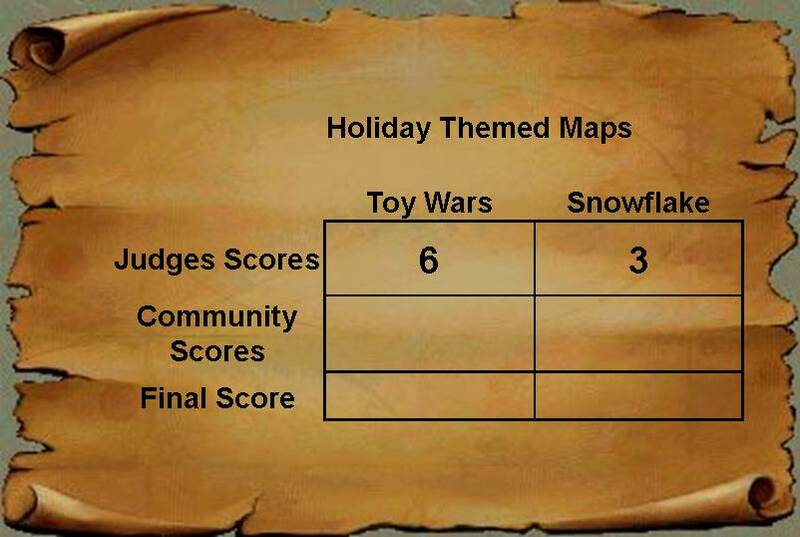 Official community judging starts next week so start reviewing those maps! Over the next several hours you will start to see the threads for the maps be "unlocked". The judges thought it would be good for you guys to not be biased by their comments... so initially I'll give you pieces of what they say and by the end of the week we should have the full report from the judges. So... Time to cast your vote! 1-10, vote for every map once, give it a score and comment on them. Header updated... added a summary for the judges scores. Ok Everyone... go put your scores down for the maps.... we need more votes from everyone! Scoring will continue for a couple more weeks. (I was going to get my posts up tonight but my computer woes won't allow it ) plus I'm hoping a few others will want to add their comments. So... let the scoring continue! Hurry... we need more scores for the maps.